Gregory Hugh Montgomery Jr. was born October 29, 1964 in Morristown and grew up in Shrewsbury. Greg was a physical, hyperactive child, as well as a perfectionist. He was also an elite athlete. He played golf, hockey and football as a boy, but injured his back as a teenager and suffered severe sciatic pain in his legs. His dream of playing linebacker for Penn State ended, but he did make the Red Bank Regional High varsity as a punter. At 6’4” and 200 pounds he dwarfed other players at that position as a high-schooler and later in college. Greg was initially recruited by Penn State, but did not play for Joe Paterno’s Nittany Lions. He transferred to Michigan State when he was 20 and punted for the Trojans for three seasons beginning in 1985. In 1986, Greg set a Big Ten record when he averaged 49.7 yards per punt in conference games. He averaged 45. 2 yards per kick for his career. Michigan State was a Top 10 team during his senior year. Greg was taken in the 3rd round of the 1988 draft by the Houston Oilers. 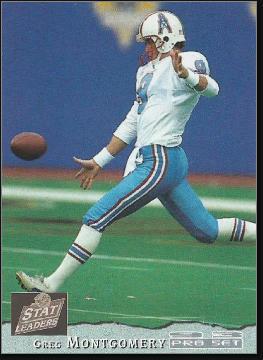 He played for the Oilers six seasons, leading the AFC in yards per punt in I990, 1992 and 1993. In 1993, Greg was named a first-team All-Pro and selected for the Pro Bowl. That season he had the NFL’s longest punt, a 77-yarder. Greg earned a reputation for being wild off the field. He covered himself with tattoos, bleached his hair, pierced his tongue and had dramatic mood swings. Teammates liked him and thought he was a little crazy. Eventually, Greg was diagnosed with bipolar disorder. Greg was very public about his illness, hoping to draw attention to a problem that afflicts between 1 and 2 percent of the U.S. population. Greg played three more seasons in the NFL—one with the Lions and his final two with the Ravens. He left the game in 1997 ranked among history’s top punters in terms of average. He real talent was net yardage—his kicks not only traveled a few yards farther than other punters, they had an extra second or so of hang time. He was also a valuable 11th tackler on the field. Only after he retired did doctors discover that he had played his entire career with a broken L4 vertebrae in his back. Greg settled in the Detroit area and became a mortgage banker after leaving the game. He also became a vocal advocate in the field of mental health. In 2010, he was the subject of the documentary Madness in the NFL: The Greg Montgomery Story. He also joined forces with Mike Ditka and Tom Matte to fight for healthcare for former players. Greg controls his bipolar with medication and a healthy diet.